1,000 Levels & More This Festive Season! ‘Tis the season of goodwill and to celebrate passing the magic milestone of 1,000 levels, we’ve got some sweet treats to unwrap, including a cool festive theme. 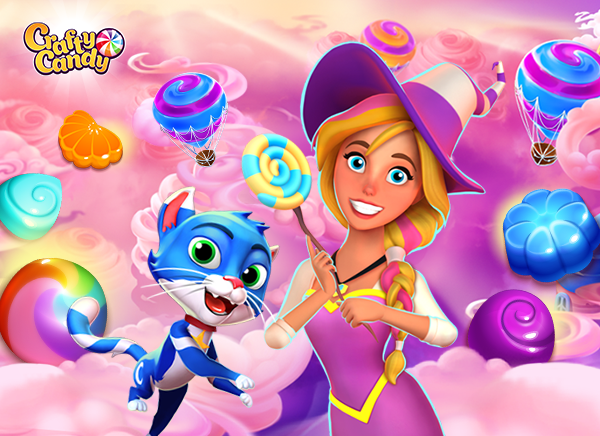 Join candy witch Candice in 40 NEW LEVELS as she cools down with popsicles in Ice Pop Plateau, before celebrating with a cherry-topped Black Forest cake in Schweet Schartz Forest. That brings the total number of fun-filled levels up to an amazing 1,030! Enjoy a BRAND NEW doughnut-dunkin’ game feature: match three doughnuts to glaze them, then match the glazed doughnuts to grab ’em! Outplay OUTPLAY PROUDLY HOSTS OUR FIRST GIRLS IN DIGITAL DUNDEE EVENT!